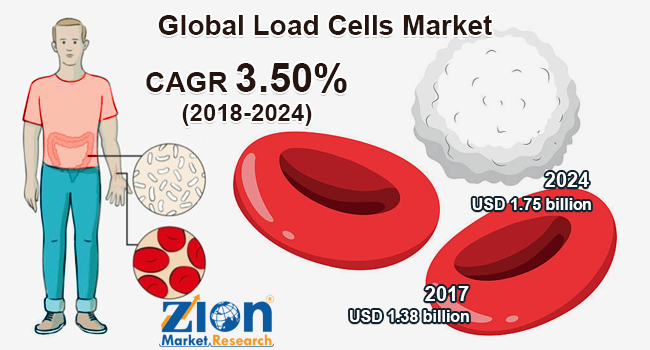 With the presence of a large pool of participants, the global load cells market is displaying a highly competitive business landscape, finds a new research report by Zion Market Research (ZMR). Vishay Precision Group Inc., OMEGA Engineering Inc., FUTEK Advanced Sensor Technology Inc., Hottinger Baldwin Messtechnik GmbH, Flintec Group AB, Thames Side Sensors Ltd., and Yamato Scale Co. Ltd., Zhonghang Electronic Measuring Instruments Co. Ltd., Mettler Toledo International Inc., Novatech Measurements Ltd., and Precia Molen are some of the key vendors of load cells across the world. These players are focusing aggressively on innovation, as well as on including advanced technologies in their existing products. Over the coming years, they are also expected to take up partnerships and mergers and acquisitions as their key strategy for business development, states the load cells market study. Citing an instance, on October 19, 2018, HITEC Sensor Developments­ Incorporation– a leading manufacturer & designer of load cells along with strain gage- based force and torque sensors – declared the purchase of Aero Sense Technologies Limited, a major producer of sensors for aerospace & industrial customers. As estimated in this report, the global load cells market stood at US$1.38 billion in 2017. Witnessing a tremendous rise during the period from 2018 to 2024, the revenue in this load cells market is expected to reach US$1.75 billion by the end of the forecast period. The main types available in this load cells market are S-Type, Single-Point, and Shear-Beam. “Global load cells market revenue is likely to gain traction over the years ahead with massive investments in industrial automation technologies,” says the author of this load cells market study. Apart from this, high product penetration in automotive assembly lines, oil & gas, healthcare, logistics, construction, defense & aerospace, industrial manufacturing & materials handling and metal & mining sectors is likely to further boost load cells market trends. In addition massive application in weighing of tanks, vehicles, vessels, silos, conveyors, quality control, R & D testing, fatigue testing, and crane performance monitoring of industrial environment will further drive the growth of load cells market in the ensuing years. Regionally, North America has been leading the worldwide load cells market and is anticipated to continue on the dominant position in the years to come, states the load cells market study. The rising demand for load cells in the aerospace and defense, bulk material handling, automotive, oil &gas, medical, and healthcare sectors is the main factor behind the dominance of the North America load cells market. The high number of market players being headquartered in North America is another significant factor that is supporting the growth of this regional load cells market.